Some of the first steps to understanding the hazard posed by a fault are to know where the fault is, when it last generated an earthquake, and how fast strain is building up that will generate an earthquake in the future. A map of Quaternary-active faults is one of the basic tools to understand the earthquake hazard of a region. 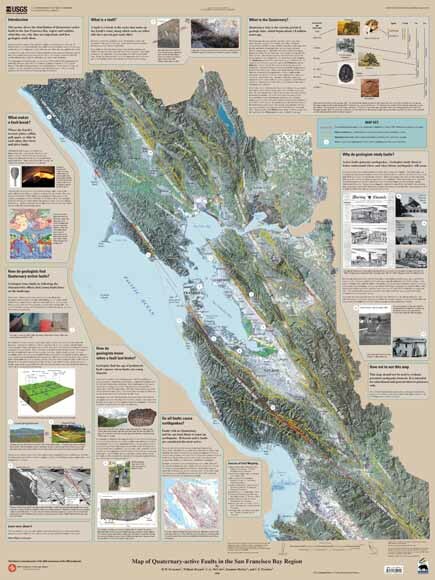 With heightened public awareness about earthquake hazards leading up to the 100th anniversary of the 1906 San Francisco earthquake, the U.S. Geological Survey (USGS) is releasing new maps of the San Francisco Bay Area designed to give residents and others a new look at the geologic history and hazards of the region. The “Map of Quaternary-active Faults in the San Francisco Bay Region” shows faults that have pushed up mountains and generated earthquakes over the past 2 million years, and are likely to be the source of the next major earthquake in the region. The map also includes answers to common questions about faults. Visit the 1906 Earthquake Centennial Alliance. Visit the San Francisco Bay Region Geology and Geologic Hazards website. Visit the Earthquake Hazards Program – Northern California website.